Inclusions: Entrance tickets to the museum, services of licensed museum tour guide in Rome. NOTE: Our guide will meet you at your hotel and take you to Borghese Gallery. Let Well Arranged Travel take you on a private Borghese Gallery tour. 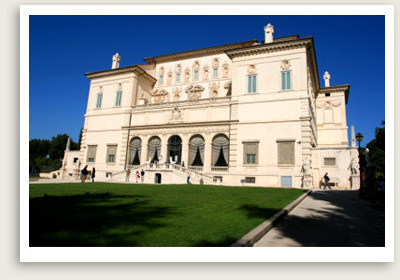 This small museum in the center of Rome is housed in a beautiful villa located in the Borghese gardens. Our licensed Rome tour guide, an expert Borghese Gallery tour guide, will take you on a private tour of this beautiful museum, originally the private collection of Cardinal Scipione, a Pope’s nephew. The Borghese gallery collection spreads on 2 floors of the villa. The villa’s salon is decorated by trompe l’oeil ceilings and frescoes by Mariano Rossi, a Sicilian artist. It is mostly of classical antiquities from the 1st through the 3rd centuries AD. This includes a famous mosaics of gladiators found on the Borghese estate outside Rome and the classical sculpture of Venus Victrix. The Borghese Gallery’s collection has since expanded to include pieces by such masters as Bernini, Tiziano, Caravaggio, Canova, Rubens and Raffaello. The collection is exhibited in a beautiful palace, surprisingly, the most silent area of the largest park in Rome.